Be sure to click through to her YouTube channel for tons of middle grade reviews and lots of other great stuff. You can play along, too! All you have to do is read middle grade books this month and post/tweet/video about them during May. Use the hashtag #MiddleGradeMay so we can all find your stuff. This year we're challenging you to choose a genre that's outside of what you normally read and dive in. 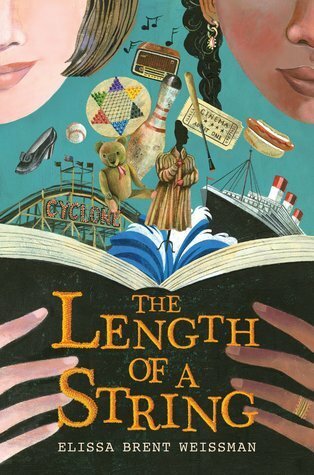 However, we're super laid back - this month is just all about discovering and enjoying middle grade lit. I've come up with a TBR pile that I'll attempt to tackle. I'm hoping I can read 10 books this month, but WE'LL SEE. And this is subject to change, of course. Here are some of the books on my TBR pile (not pictured are a ton of digital galleys that I will choose from, too!). Will you be reading along with us this month? What books or genres are on your #MiddleGradeMay TBR list? Here's an easy display for you that works for both physical or online book displays: genre award finalists. 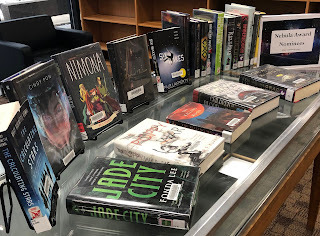 One of the my first adult book displays that I put up was an Edgar Award Nominees display and it went like hotcakes (maybe because my patrons LOVE a mystery). Using award nominees is an easy way to quickly put a list together and come up with titles to refill your display. Using nominees instead of just category winners expands the number of titles you have to choose from, allowing for more flexibility and a greater ability to include books by authors of color, etc. 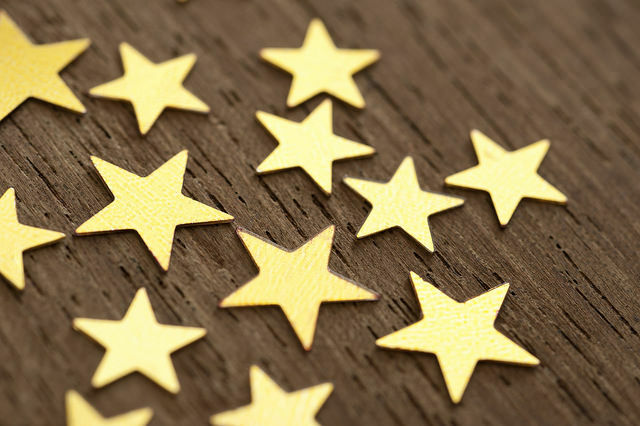 Not only does using the award nominees give you a pre-chosen list to pull for your display, it's a great way to educate patrons (AND STAFF) about these awards. 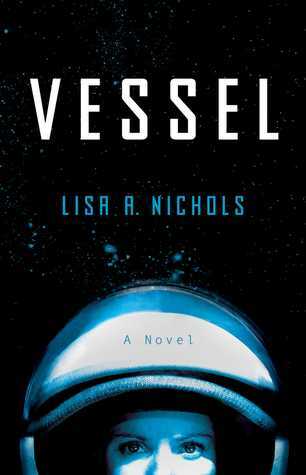 If they're huge mystery or sci-fi readers, they may already be familiar with these awards, but chances are there are general readers who are not. Don't limit yourself to just this year's finalists or shortlists. Check previous years and pull back list titles to expand and refill your display. These are just a handful of the options. What book awards have given YOU great displays or would you like to try out at your library? This year, I took on a project that I have wanted to do for a long time: Firefly Book Award Kits. 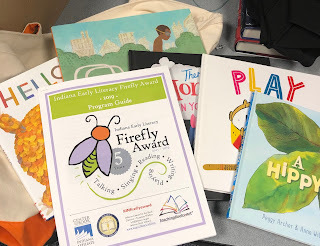 The Indiana Early Literacy Firefly Award is a kids-choice state book award started in 2015 and aimed at ages 0-5 and featuring books that develop early literacy skills in our youngest readers. 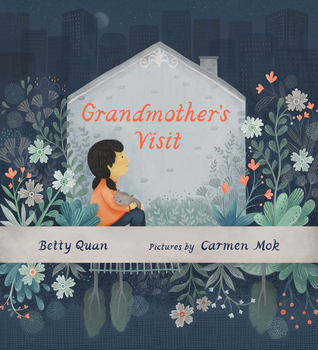 Each year, a committee of professionals selects 5 nominees and children 5 and under may vote for their favorite. We've done some programming around the Firefly Award in the past and set up a voting station in our Children's Room, but this year I really wanted to push it with our local early childhood educators and see if we could get them involved. I created five Firefly Award kits that each include a copy of each of the five nominees, the 2019 program guide (super useful - it contains ideas on how to share the books, craft ideas, ideas for voting, etc. ), and 20 ballot sheets. Each kit checks out for one week and any teacher who checks out a kit and returns children's votes will be entered into a drawing to win a set of all five books. I set the kits to check out for one week because we're starting a little bit late and I'm trying to get the maximum usage out of them before votes are due on May 15. We'll see how it works - if we repeat the program next year hopefully I will be able to start earlier in the semester so we have more time and we may adjust the checkout period. For our pilot program, I'm first reaching out to local early childhood teachers because we'll get huge bang for our buck that way. I started last week and all five kits are checked out to teachers. If we start having kits sitting on my shelves, I intend to put them out for any families to check out. I purchased DALIX zippered cotton canvas bags through Amazon for about $13 apiece. I have my eye on heavier-duty canvas totes via Lands End or LL Bean, but for this pilot project I decided to go with cheaper bags. If we like the program and continue it, we'll probably invest in higher quality bags. 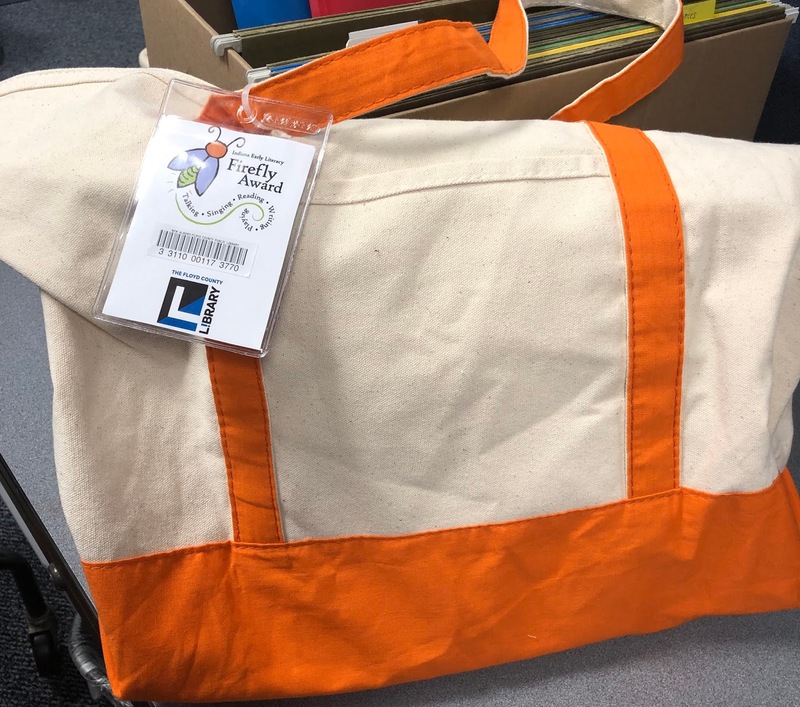 We will also look at vinyl bags or other options that are not cloth - critters aren't a huge concern to me with bags circulating to schools, but we can never be too careful. I purchased a set of plastic tag holders that came with zip ties to affix the kit labels with barcodes to the bags. On the back of the label, I printed the contents of the kit. I realized that I needed to attach a second tag with the delivery and pickup information, so if we continue the program in future years I will look for better solutions. My hope is that we will have success and continue the program and then the bags can be an investment that we reuse each year with the new nominees. The best deal I could find on the hardcover picture books was through Ingram. I ordered them non-processed and put labels in the front of each book with the kit's barcode. That way if they get separated we know where they go. When we give away the books, we'll put a new label with no barcode over the top of it so teachers can be reminded of their awesome library. Giving away the books once the program is done was my cataloger's idea. That way we don't take up extra shelf space with multiple copies that we probably no longer need, and it's an extra incentive for teachers to participate in the program. My hope is to collect 100 votes via this program this year. Last year we were in the throes of our huge staffing restructure and we submitted 0 votes for our county, so if I can get 100 votes to submit I will be happy and that will give us something to build on. I'll be sure to update and let you know how it goes! Read on for information about my budget and staff time for this project, as well as files you can use if you want to replicate it at your library! **Printing costs may vary and may be something your library can absorb in its normal operating budget. We printed ours in-house, so I did not really need to budget for this, but you might! * Much of this can be reused in future years. We will still have to process new kits, but I won't have to design new labels, etc. ** You may or may not need to do all these tasks yourself at your library. Next year I will probably let other staff members handle a lot of this since it fits in with our School Collection program that we already run. I just didn't want to load up their plates with my project before I knew if it would be successful. You have my permission to edit these and use them however you like. The Firefly Award makes its logo available for use in promoting this program. Bag labels designed to fit in 3" x 4 1/8" tag holders (Publisher file). These include the Firefly logo, but I took our library logo off. Feel free to edit. We placed barcodes between the two logos. The letter I sent to teachers (Word file). I emailed this to the teachers and preschool directors that I had contact info for and mailed it to other preschools and daycares in our area. 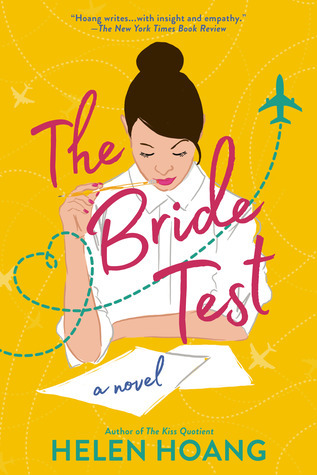 This year, one of my reading resolutions is to read more romance novels. It's a genre that I am not very familiar with and it's a super popular one with my library patrons. I'm calling it The Romance Project and I made a list in my bullet journal of titles to seek out this year. I'm constantly adding to the list, so I would love to know your favorite romance titles and authors, particularly authors of color and queer romance. 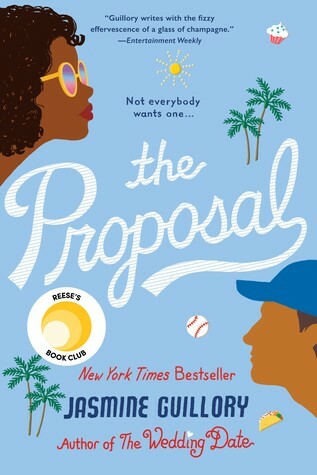 The Proposal by Jasmine Guillory (Berkeley Books, 2018). When Nik's boyfriend of a few months proposes to her on the jumbo screen at a baseball game, she turns him down (OF COURSE) and is thrust into the spotlight. Carlos comes to her rescue, helping her escape the stadium before camera crews can track her down, and they start hanging out. Neither is looking for anything serious, but as they start to get to know each other they discover they actually have a lot in common... I really liked this one! It's a fun story and I really liked both the leads. I liked that Nik is a strong independent woman who can take care of herself. 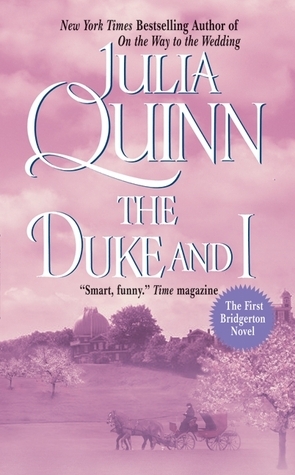 The Duke and I by Julia Quinn (Avon Books, 2000). Daphne's the girl everyone likes but no one loves, much to the chagrin of her mother who is trying to get her eldest daughter married off. Simon is the mysterious duke who's just appeared back in town and caught the eye of every eligible woman AND their mothers. 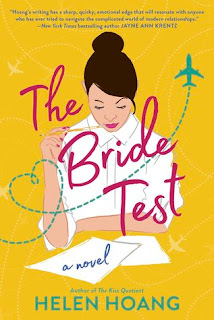 When Daphne and Simon meet by chance at a party, they decide to start a fake courtship to get Daphne's suitors more interested and to get the mothers off Simon's back. 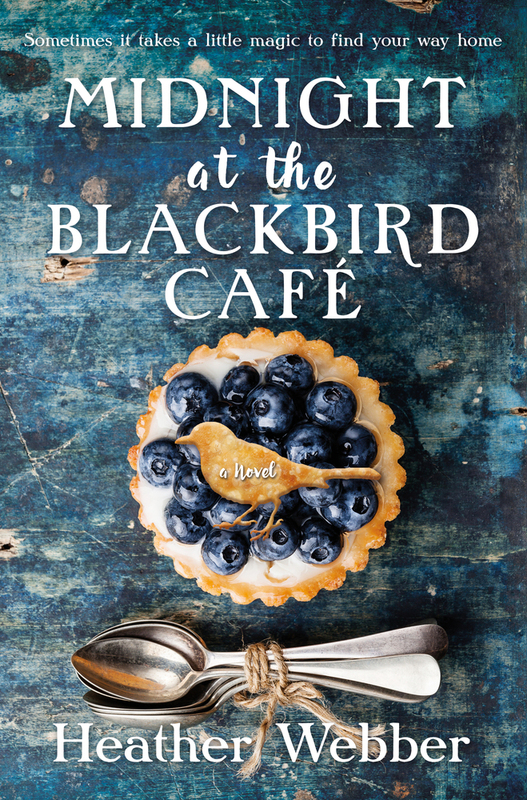 Julia Quinn is an author recommended to me by multiple readers and I can see why she has fans - there's a lot of humor in this book and very likeable characters. I found some major elements of this book pretty problematic and it wasn't for me. I am going to try some different historical titles and I'd like to try a more recently published Quinn (let me know if you have a recommendation!) and see if I like that better. 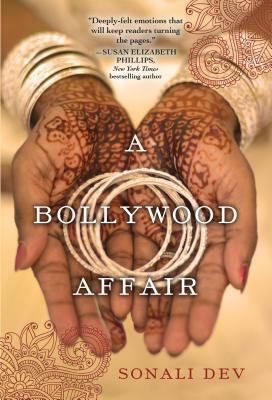 A Bollywood Affair by Sonali Dev (Kensington, 2014). Married at four years old, Mili Rathod has dedicated her life to being the perfect wife, despite the fact that her husband, an officer in the Indian Air Force, has never come to fetch her. Samir Rathod has tracked Mili down at her Michigan college to secure a divorce for his brother - their child marriage was supposed to have been annulled but his grandfather never followed through. 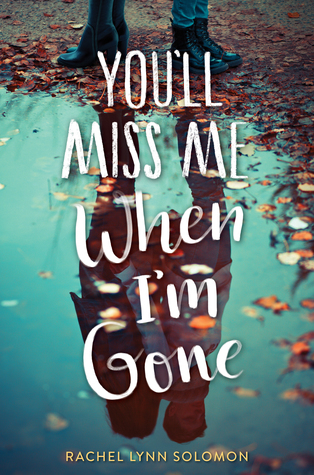 But when Mili is in an accident and Samir comes to her rescue, the two start to become friends and then maybe more, even as they're both carrying secrets that will devastate the other. I really enjoyed this one, too. 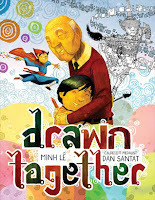 I liked the cultural details included and the slow development of Mili and Samir's friendship and eventual romance. I listened to this one on audio, narrated by Priya Ayyar, and it was just what I needed to get motivated to work out on these cold February days. So that is the state of my Romance Project so far. I'll check in again soon! What titles and authors would you recommend I add to my list? You all. 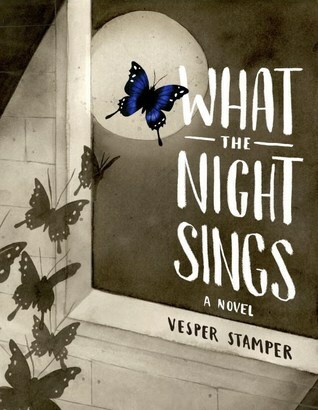 This was a book that I COULDN'T PUT DOWN and that does not happen to me very much. I am a very distracted reader and I'm usually reading many books at the same time. I heard about this true medical thriller at the ALA Midwinter conference at one of the Book Buzz panels and they mentioned that it had been so popular that all their galleys were gone. I can definitely see why. Steffanie Strathdee and her husband Tom Patterson were traveling in Egypt when Tom first got violently sick. After dealing with a poorly equipped hospital in Egypt and being medevacked to Germany, they figured out that he had contracted an infection from a superbug - a virulent drug-resistant bacteria. Tom kept getting worse and worse and doctors started to Steffanie her that there was nothing more that could be done. So epidemiologist Steffanie took matters into her own hands, researching phage therapy - treatment involving virus phages that attack bacteria. The treatment was not FDA approved and there was no guarantee that it would work, but they were desperate and ready to try anything... if they could get approval in time. Not only is this a page-turning thriller that reads like the best episode of ER ever, it's written in a very relateable style and with lots of humorous moments. I enjoyed the writing as much as the subject matter. Strathdee has a talent for explaining a lot of complicated medical stuff in ways that make it easy to understand and engage with. I learned a ton and super enjoyed the reading experience. It's definitely disturbing in parts and this book won't be for everybody - it's graphic in its descriptions of Tom's illness, hypochondriacs and the squeamish should stay away. Plus, the threat of drug-resistant bacteria is a very real threat that humans have created and ignored for so long that it's pretty scary. Readalikes: Hand this one to readers who enjoyed the true medical drama Brain on Fire: My Month of Madness by Susannah Calahan. This is a similarly fast-paced medical mystery story dealing with unusual illness. Of course one of the heavy hitters in the medical thriller genre is The Hot Zone: The Terrifying True Story of the Origins of the Ebola Virus by Richard Preston. 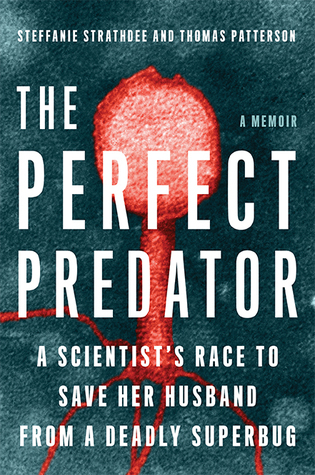 Readers who enjoy the fast pace and gory details of The Hot Zone will also like The Perfect Predator. And Steffanie Strathdee's talent in educating about medical topics like vaccines and microbiology in an engaging way reminded me a lot of another favorite science book, The Poisoner's Handbook: Murder and the Birth of Forensic Medicine in Jazz Age New York by Deborah Blum. Although it's a different type of medical topic, I think readers who are interested in engaging science writing will enjoy both books. 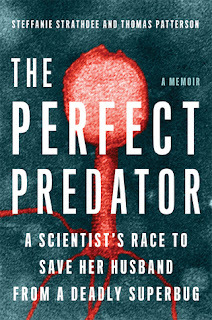 The Perfect Predator: A Scientist's Race to Save Her Husband from a Deadly Superbug by Steffanie Strathdee and Thomas Patterson. Adult. 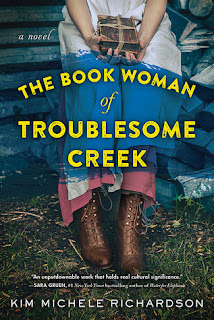 Hachette Book Group, February 2019. 304 pages. Reviewed from ARC received from publisher. Jordan Banks loves art, but his parents refuse to send him to the art school he wants to go to. Instead, they enroll him at the prestigious private school Riverdale Academy Day School where Jordan turns out to be one of the few kids of color in his grade. His parents keep telling him that this school will help him learn how to navigate the world at large, and he's smart and can excel in a rigorous academic environment. But at this school Jordan has to deal with things like students AND teachers mixing his name up with the names of other African American students, getting stared at whenever teachers mention students on financial aid, and the only books the school librarian recommending to him being gritty tales of African American kids dealing with gang life or prison. It's hard enough to be the new kid in school without having to deal with all the microaggressions he gets every day. Jordan's parents say that if he still doesn't want to go there by ninth grade, they'll let him go to art school, but can he survive until then? This book had so many moments that tell it like it is. 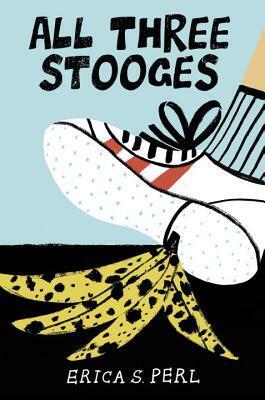 It's probably the best middle grade book at dealing with microaggressions that I've seen. It does not stray away from how uncomfortable it makes Jordan, even when his white classmates and teachers don't realize what they're doing. This is a book that kids of color will identify with and that white kids need to read and talk about. And it's written in a fun way. Full-color panels illustrate Jordan's day to day life in school split up by black and white spreads from Jordan's sketchbook as he reflects on stuff that's happening to him at school. Each chapter is named and illustrated for a spoof on the media (example: Chapter 3: The Hungry Games: Stop Mocking J). A blurb from Jeff Kinney on the front cover does not lead readers astray - this is a funny story talking about serious stuff. 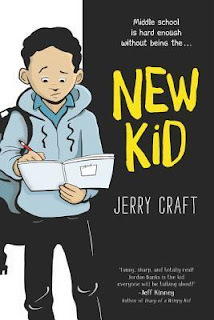 Jerry Craft really uses humor to delve into heavy topics in a way that makes them approachable. This is a must-purchase for your library shelves, especially if you have readers of contemporary realistic graphic novels. Readalikes: I feel like most contemporary realistic graphic novels get compared to the powerhouse Smile by Raina Telgemeier, but I think it really is an apt comparison here. They're both loosely plotted, taking place over the course of a year or years, and both feature protagonists that are navigating the tricky waters of middle school while feeling different from everyone around them. The theme of being one of few kids of color at a prestigious private school and dealing with microaggression after microaggression makes this a great readalike for Piecing Me Together by Renee Watson. 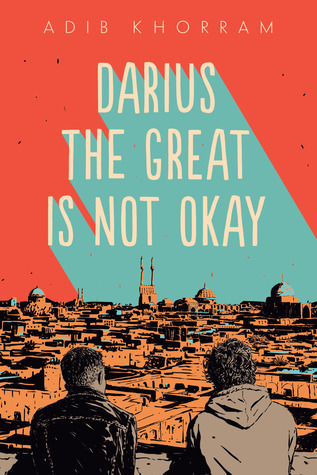 And readers looking for more strong stories of middle school African American kids navigating things other than grit may enjoy Jason Reynolds's Track series. New Kid by Jerry Craft. Grades 4-8. 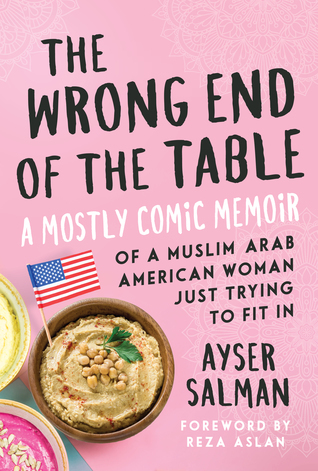 HarperCollins, February 2019. 250 pages. Review copy provided by my local library. 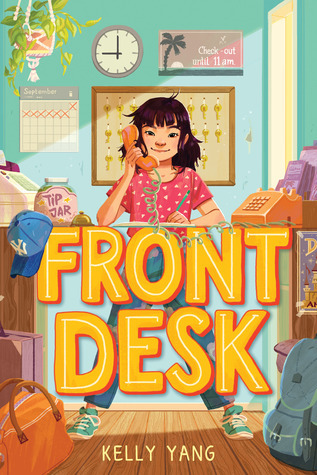 This year, for the first time, the recipients of the winners of youth literature awards from ALA's affiliate organizations were announced at the Youth Media Awards announcements. 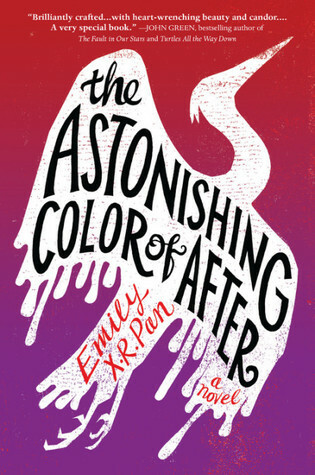 This includes the Asian/Pacific American Librarians Association (APALA)'s Literary Award, the Association of Jewish Libraries Sydney Taylor Book Award, and the American Indian Library Association's American Indian Youth Literature Award (which is announced in even years, so there were no winners to announce this year). Due to time constraints, only the winners of these awards were announced and that resulted in some justifiable indignation that the honor books were left out. I want to focus first on the books here, so here are the winners AND honorees of the APALA Literary Award and the Sydney Taylor Book Award. Then keep reading for more thoughts. The American Indian Youth Literature Award is presented in even years, so there were no awards announced for 2019. During the announcements, ALA President Loida Garcia-Febo did mention that there were honor books that could be found on the organizations' websites, but they were still difficult to track down. Twitter erupted with justified indignation that the honor books for these awards were not announced (only the winners proper). Jody Gray, director of the ALA Office for Diversity, Literacy and Outreach Services, offered this response, which has not been as widely shared on social media. Go and read it, I'll wait. I think it's important to note that this is the first year of adding these awards to the announcements and there are many moving pieces to the scheduling puzzle that are really difficult to navigate. I regret that anyone felt left out and excluded when I know the intent of this change was to be more inclusive. I think it's important that we continue to work towards a better solution. I myself would have loved to hear about the honor books at the announcements. Many of them I haven't read and I am so glad to be exposed to them now (my holds list at the library has grown so long!). I believe that ALA is listening and I also believe that we can do better and that ALA wants to work towards that. Gold stars. Photo by Creativity103, used under Creative Commons license. FIRST OF ALL, a hearty congratulations to the winners and honorees of the 2019 Youth Media Awards, announced Monday in Seattle. I'm pleased to say that I dragged my two roomies out of bed to come with me to the live announcements (they are NOT morning people). I have to say that I am especially pleased to see The Night Diary by Veera Hiranandani win a Newbery Honor because that was a book of my heart this year, which means it was one of my own personal favorites. And it is always pleasing to see your favorites win an award and get an acknowledgement that others see the good in it, too. Now. We librarians get super excited about the Youth Media Awards. And we all have our favorite titles. And we LOVE IT when there are lots of honor books. The more the merrier, right? But I need to set the record straight on one thing. If there are only a few honor books selected for an award, that does NOT IN ANY WAY MEAN that there were no other books worthy of distinction. It means that these books selected were the ones that a diverse committee of 15 different people, people from different kinds of libraries, from different areas of the country, from different types of experiences and backgrounds, could all come to a consensus on. Have you ever tried to get a group to agree about anything? Have you ever tried to get a group of fifteen people to agree about anything? 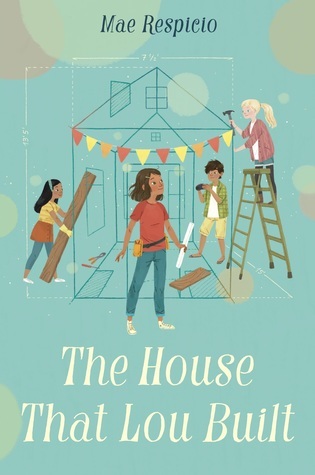 I guarantee you that every single person on the 2019 Newbery Committee had additional books that they would have loved to see get an Honor sticker. I guarantee that every person on that committee had at least one book that broke their heart a little bit when it didn't make the final list. 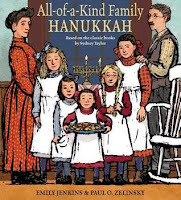 My 2015 Newbery Committee was also a committee that "only" had two honor books. 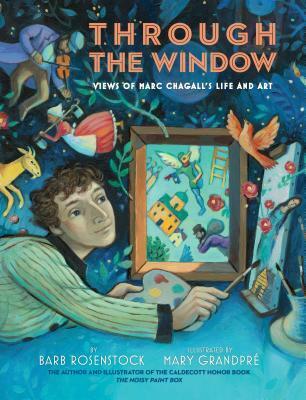 And yes, we heard the disappointed sounds from a room of thousands when the number was announced (especially on the heels of the 2015 Caldecott committee announcing SIX honor books). 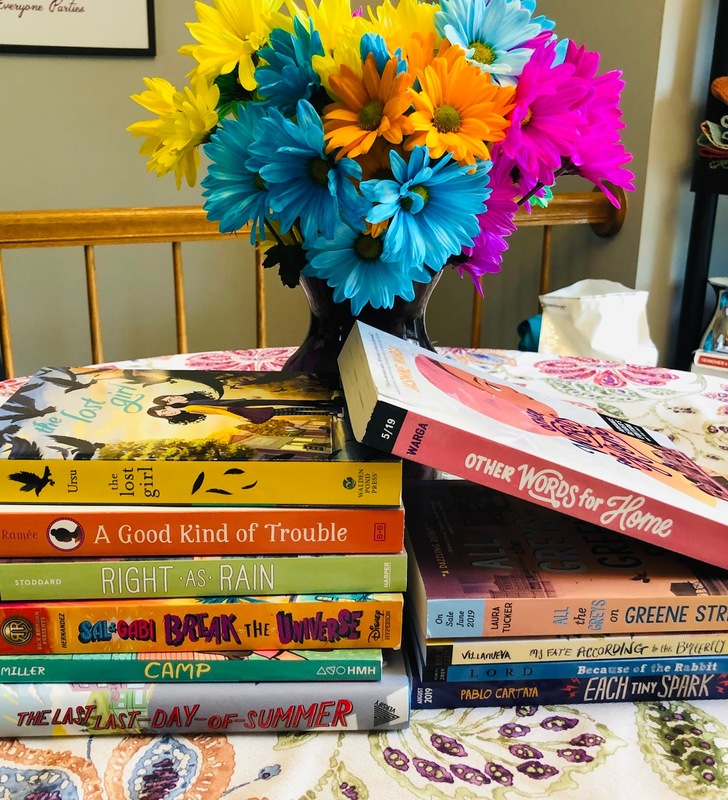 All I can say is that the winner and two honor books announced were the three books that our committee could come to a consensus on out of a field of dozens of wonderful books. That's how the process works. And it works that way to make the awards mean something. 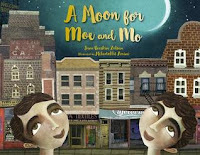 If I got to give a Newbery honor sticker to every book that I personally found amazing, that would be super fun for me, but it wouldn't mean much to the rest of the world. It's the consensus that makes the award mean something. It's why the committee ballots and re-ballots until a book meets the required score to be declared a winner. You can read more details about the process in the John Newbery Award Committee Manual and I highly recommend that you do so if you're curious about how it all works. Just because your favorite book didn't get a shiny sticker on it this weekend doesn't make it any less a favorite. I call these "books of your heart". Don't stop loving that book. Don't stop sharing that book and pushing it into the hands of children. Ultimately, it's not a shiny sticker that's going to get that book into the hands of every child who needs it. It's you, the gatekeeper. It's you the librarian, the teacher, the parent, the friend. Keep matching up your favorite books with their readers. THAT is what makes those books shine, not a sticker. Today I'm headed West to Seattle for the American Library Association Midwinter Meeting. I am super excited to attend some great programs, reconnect with colleagues from all over the country, and learn about all the great new books coming out this spring. I will be live-blogging for the ALSC Blog, so make sure you jump over there to see my posts and the posts from the other live-bloggers throughout the conference! And follow me on Twitter @abbylibrarian for more frequent updates about the conference. I'm looking forward to learning a lot from the PLA preconference Advancing Racial Equity in Public Libraries: Normalizing, Organizing, and Operationalizing on Friday. I am so excited to hear Sylvia Acevedo speak (as you will remember, I LOVED HER BOOK). I was invited to a celebration of Kwame Alexander's new imprint with Houghton Mifflin, Versify. 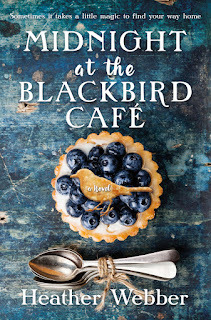 As you know, I am a huge fan of Kwame Alexander ;) and I am super excited for this new imprint. 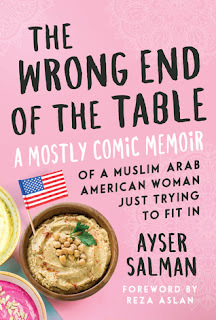 I can't wait to see what titles will be honored this year at the Youth Media Awards and this is the first year that titles selected for awards by the American Indian Library Association, Asian/Pacific American Librarians Association, and the Association of Jewish Libraries will be shared at the YMAs! I am so glad I get to be there in person! But you can also watch a livestream of the awards on Monday, January 28 starting at 8am Pacific. 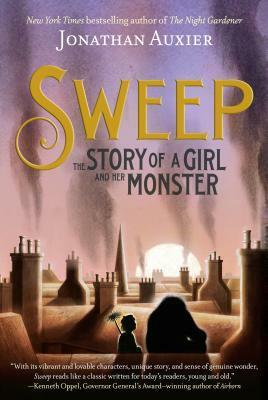 If you'll be at ALA Midwinter, I hope to see you! If you're left behind this year, don't forget to follow the hashtag #alamw19 to stay up to date on all the conference goings-on.